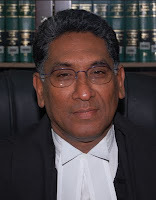 Justice Vikramajit Sen has been appointed as the Chief Justice of the Karnataka High Court thus replacing Justice Khehar, who in turn has been elevated as a judge of the Supreme Court of India. Justice Sen is likely to be sworn in as the new Chief Justice on 12th September, 2011. Born on 31st December, 1950. Attended St. Xavier’s School, Delhi and passed the ISC in the First Division. Graduated from St. Stephen’s College with Honours in History. Attained First Division in LL.B from Faculty of Laws, Delhi University, and was Awarded the First Prize in Moot Court and Silver Medal in Labour Laws. Captained Faculty Teams in Basketball and Tennis and was chosen Sports Secretary. Practiced in all the Courts in Delhi, although primarily in the High Court of Delhi. Handled civil, arbitration and commercial disputes. Had a special interest and consultancy on minority rights. A Core Member of the Inter Denomination Committee for recommendations for Amendments to the Personal Laws relating to Christians in India. Member of Governing Body of several reputed Colleges and School throughout India. Appointed as an Additional Judge of the Delhi High Court on 7th July, 1999. Appointed permanent Judge on 30.10.2000. Member of the Malta Judicial Conference under the auspices of the Hague Convention. As a Member of the Planning Committee of the Common Law – Commonwealth Conference, 2009 attended the Conference in Hyderabad in February 2011. Member of International Association of Family Judges. Member of International Judicial Conference on Cross-Border Family Relocation, 2010 Washington D.C.. Co-Moderator in the Conference on Mediation organized in association with Hong Kong Mediation Council and Hong Kong International Arbitration Centre. First and Continuing Chairperson of Delhi High Court Arbitration Centre. In this capacity was involved in its establishment as well as its continuing operation till date. Member, National Legal Services Authority and Executive Chairman, Delhi Legal Services Authority. Unlawful Activities (Prevention) Tribunal declaring Deendar Anjuman as an unlawful Association in the year 2003. Unlawful Activities (Prevention) Tribunal declaring Liberation Tigers of Tamil Ealam (LTTE) as an unlawful Association in the year 2008 and 2010. It is great to see a judge from Delhi High Court doing so well. Also good that we got rid of Justice Deenakaran.